Today We've got Happy News!! 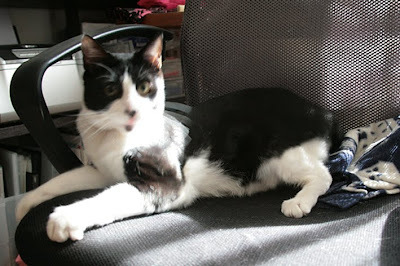 B-sensei has accepted into the KOOL SENIOR KITTY KLLUB by Sammy and Andy!!! We are Soooooo proud that B-sensei has become a member! Because he is going to be 14 next months and this badge really made him happy! We are very happy that B-sensei has something to be proud of!!! And that was not the only thing that made us happy. Keiko from Kitty Trio gave this amazing award!!! You are really our angel,dear Keiko!!! Rule 1. Thank the person who gave it to you. Rule 2. Share 9 things about yourself. Rule 3. 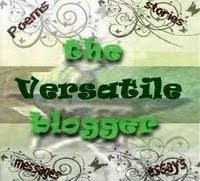 Pass the award along to 9 bloggers who you think are fantastic. Rule 4. Contact Blog award winners. 1. Ku-suke loves to stick to mom every night when sleeping. He loves to put his bottom on her face. 2. 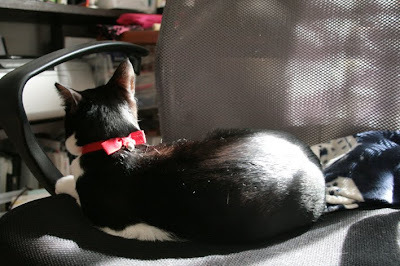 Teko-chan likes to sleep alone wherever he likes. 3. B-sensei likes to sleep in his little bed. 4. B-sensei's fur is a little fluffy. Ku-suke's fur is soft and shiny. Teko-chan's fur is slippery grossy. 5. B-sensei had caught a pigeon only once in his life. Mom was horrified when she found the poor pigeon's dead body. Balcony was the only place where he could catch the poor pigeon. Mom still wonders how he could do that. She could see no blood on the pigeon's body so maybe she had been dead already... Mom hopes she had. 6. 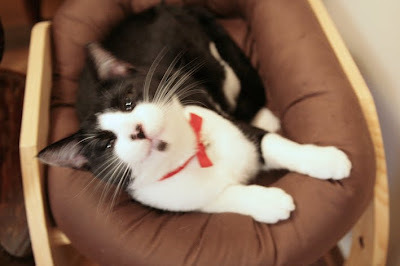 Mom thought Teko-chan might be a Scottish Fold when he was a tiny baby kitty. But the vet was kind enough to explain that every tiny kitty's ears are separated like those of the Scottish Folds. 7. 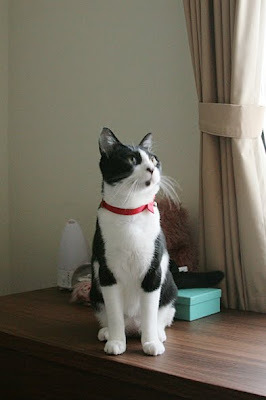 Ku-suke was like an alien kitty when he was little. Only the eyes were big and he was so skinny. Dad and Mom thought his face was funny. 8. 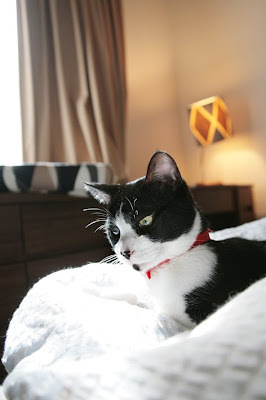 Jean,who went to a very happy forever home from us was absolutely a cute boy. His meow was sooooo cute,he was saying "mmmmmeow"! 9. Teko is the only one who loves both Mom and Dad equally! Because we know some of you already have this award, and we think all of our friends deserve this award!!! So we would like to send this award to anyone who's interested! Please feel free to take it!!! 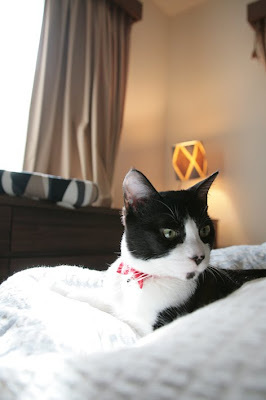 Today,we want to introduce how Teko has so many looks on his face!! 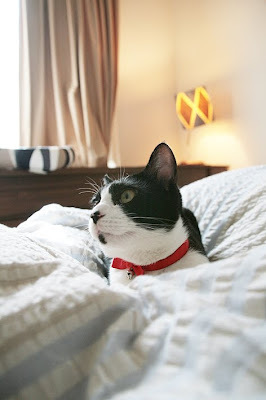 Teko -chan wants to talk to you! Mom says my face is funny. "Noooooooo Teko-chan,you are a horror movie!!" She is sometimes very rude to me. I'm a good looking kitty. Or you can call me lovely. I am really good at surprising mommy!! I can be a cutie when asking mommy to rub more! Of course I can be handsome,too. I can do any face!! Today,I will show you a picture of myself when I was a baby!!! It is Thursday 0:50 AM here in Tokyo! 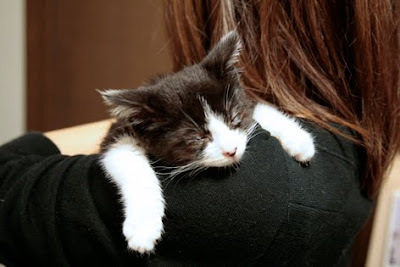 I love the kitten picture! Have a happy day in Tokyo! 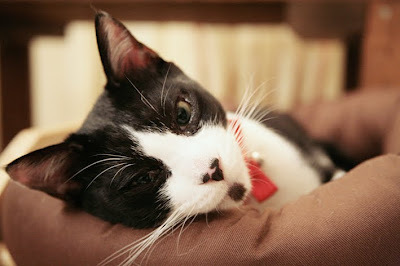 B-Sensei congrats on being in the Senior Kitty Klub we are now klub mates!!! 'feel free' about the award!!! Perfect you are learning English phrases very quickly!!! Teko your faces are all absolutely gorgeous. Your markings are nearly symmetrical and each picture of your face PERFECT!!! We are glad you enjoyed watching Madi in motion. What a great post! Congrats on the award! 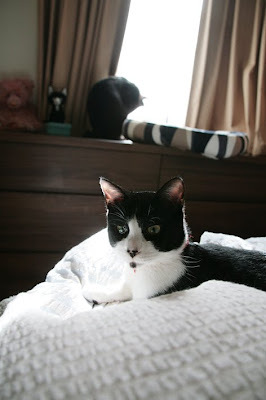 It is funny you say Ku-Suke looked like an alien cat as a baby because our kitty Lola was the same way - she also looked like an alien! 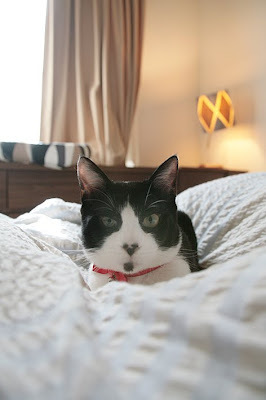 We think you are all gorgeous kitties - and Teko, we love your face, especially your little nose spots! Congratulation onthe club membership!!! I love all of the pictures, but the last picture is so special! ConCats on your award! We LOVED all of your answers. And we think you make GRRR-8 faces! They are ALL SOOOOOOOOOOO cute! It is still Wednesday afternoon here! Congratulations, B-sensei! Hey, Teko, guess what? When my Mommeh rubs my nose, it makes my mouth open up a little bit, too! She thinks it looks cute. Teko!! You are a gorgeous and utterly handsome and beguiling kitty!! Congratulations to you and B-Sensei and Ku-suke for these wonderful awards. Yay!!! It's lovely knowing a little about all of you! Poor Ku-suke - you are a sweetheart and the only reason you stayed longer in the shelter was for your mum and dad to find you! Of course! And B-Sensei - you made me and Charlie go "oooooh yuck" with your pigeon escapade! Oh dear! And Teko we love that you love your mum and dad equally! Also your sweet little kitty pic is adorable. 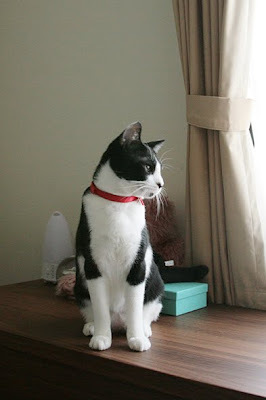 We are sad about Jean - but it's great to know he went to a happy and lovely forever home! We also gave you an award today! What a cutie you were when you were a baby, and now look at you! You are very beautiful. I love all the pictures of your many faces. Yes, you are just one very special cat. 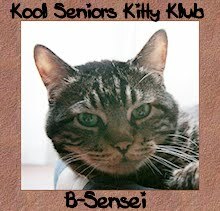 Congratulations B-sensei on being admitted to the kool senior kitty's klub. Congratulations to your mom for the lovely award she received. I enjoy coming here so much. You have a lovely blog. Teko you are so very cute, but you did scare me a little when you turned around like that! I have heard of it !! Many faces, but they're all cute faces!